Elephant seals are the largest of all seals, they show a strong sexual dimorphism (difference in size between the males and females). A fully grown male and female side by side are commonly mistaken for an adult and juvenile. Breeding Season: Pups born from September to October shortly after the arrival of pregnant females on the birthing beach. The pups are nursed for about three weeks after which the mother goes to sea at which point the pup is weaned, the pups remain on the breeding beach for 8-10 weeks before going to sea. Females mate a few days before the pup is weaned, there is probably an implantation delay and then the female is pregnant. Estimated world population: - 650,000 in the mid 1990's no more recent worldwide estimate is available. Feeding & diet: Mainly squid, but also fish, especially Notothenids known as "Antarctic cod", about 75% squid to 25% fish. Males and females tend to feed separately with males going further south pursuing bottom dwelling (benthic) prey, females don't go so far south and fish for prey in the mid-water (pelagic) zone. Diving: Southern Elephant Seals are impressive divers, regularly going down to 300-500m for a duration of 20-30 minutes. A record depth of 1430m was attained by a female with another recording a time underwater of an incredible 120 mins, the longest ever recorded for any seal. Distribution: Circumpolar, though they are found throughout Antarctica in low numbers down to the deep south, they are most numerous north of seasonably variable pack ice in sub-Antarctic waters and on sub-Antarctic islands, they are found as far north as the Falkland Islands and the Peninsula Valdes at 42°S. 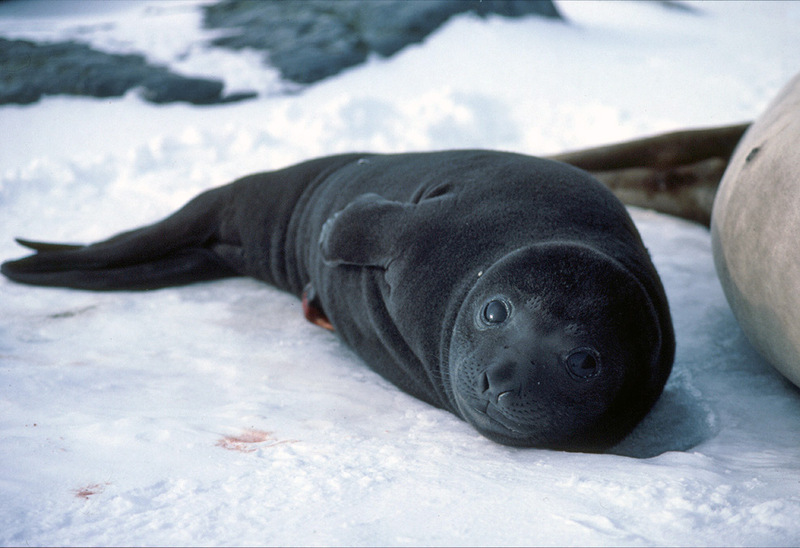 Predators: Killer whales, large sharks in the more northern parts of the range, Leopard seals also sometimes kill elephant seal pups. What are Southern Elephant Seals like? There are two species of elephant seals in the world, the Northern Elephant Seal that is found in the eastern and northern Pacific Ocean and the Southern Elephant seal that is found almost circumpolar around Antarctica. 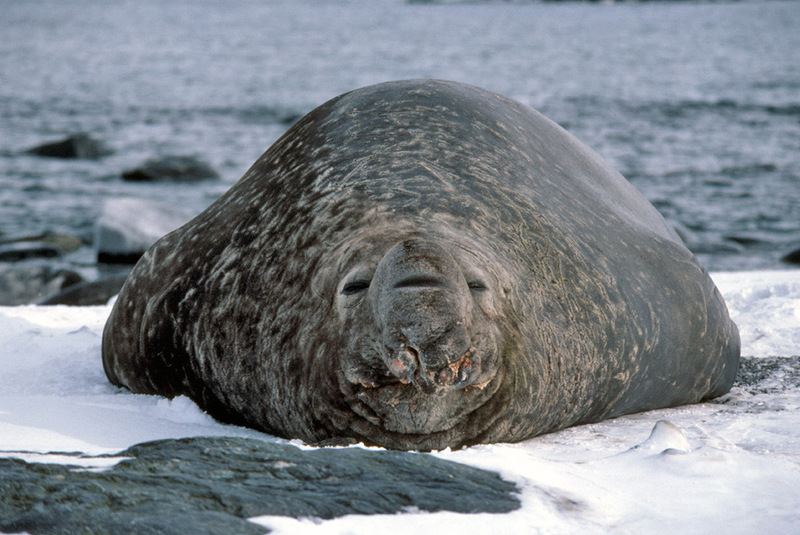 The Southern Elephant seal is the largest of all the world's seal species, southern males are up to 50% heavier and females 20% heavier than their northern counterparts. They are enormous animals that regularly reach 2,000 kg and may weigh up to 4 tonnes (8 800lb). 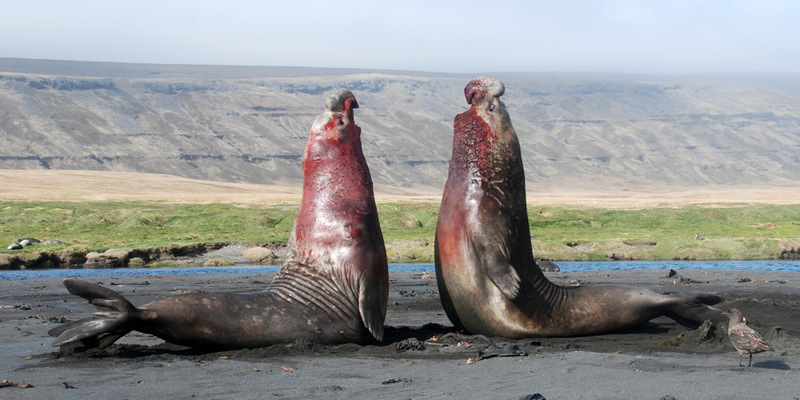 Southern Elephant seals show a very strong example of sexual dimorphism (a physical difference between the males and females), Males may be up to ten times the weight of reproductive females, only the very largest males will reproduce which is about 2-3% of all males. A fully grown male and female side by side are commonly mistaken for an adult and juvenile, the picture to the right shows a fully grown male and female. They are called elephant seals partly because of their size and also partly because of the males snout or trunk that he inflates to impress and intimidate rivals when competing with other males. The trunk is inflated with air and a loud bellowing sound is made, the depth and volume of the sound being a way of the male demonstrating to others how big and strong he is, so avoiding fights with obviously smaller and weaker males. 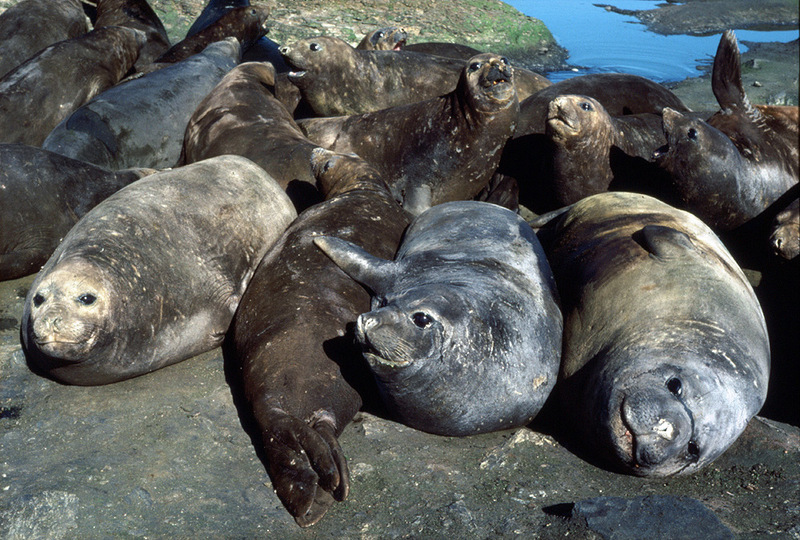 Like some other species of seals, Elephant seals (both northern and southern) breed in a "harem" system. Females arrive in the spring at a beach where she herself was probably born, this leads to a build up of numbers of females and pups in these locations. Many seals have something called delayed implantation whereby after mating, the embryo rather than implanting into the womb lining goes into a sort of stasis phase, so delaying the onset of pregnancy proper. By these means, these usually very widespread seals can assemble together at a beach where for the only reliable time in the year, there will be reproductive males and females together. The scene is therefore set for the males to compete with each other for mating access to the females. Only the very largest, most aggressive, most tenacious and strongest males will win. On elephant seal breeding beaches (they prefer gently sloping beaches where they can leave the sea easily) the largest male is called the "beach master" and he will defend his harem of females for 24 hours a day without rest or feeding during the breeding season. Fights are actually quite rare, the males usually size each other up quite accurately and settle the matter by bellowing and rearing up. Only when two of the largest males are closely matched does a fight result. This consists of them lifting themselves up and throwing all the weight they can muster (and it's a lot of weight!) at the opponent. Such fights can be very bloody and exhausting though serious or permanent damage is rare, there is a very significant layer of blubber to take the blows. An individual male will usually only have one breeding season where he is large enough and strong enough to become beach master. The constant wakefulness, attention, elevated stress hormone levels, fights and lack of food mean that he is unlikely to be as in good condition for a second year. After breeding males play no more part in the rearing of any pups, the females by this means, assure that their pups are fathered by the strongest and fittest males only. The picture above is of a male who has sustained damage to his trunk during a fight. This makes him less able to compete with rival males and so he was master of a very small harem of 2 or 3 females rather than up to a hundred that the biggest and strongest males can command, he did however come back to the same small beach to breed for several years as he was not so stressed with defending a much bigger harem against many more opponents. Is all elephant seal life aggressive? Not at all, the breeding season is quite short, for much of the year elephant seals spend their time at sea not really associating with any other seals, they do come ashore at some favourite and much used beaches to moult when they form associations called "pods". Pods are extremely smelly places. If the wind is towards you, you know you are coming up to an elephant seal pod long before you see it! A diet largely consisting of squid doesn't do much for the state of your digestive system or your breath, you really don't want to be breathed on by an elephant seal. Most of the time pods are quite fairly restful places in a constant snoring and guttural grumbling sort of way, but every now and then one of the inner most seals decides it wants to go to sea. Two tonnes or more of seal lumbering across his sleeping companions causes quite a commotion. Elephant seals spend only a small amount of their time on land. Ashore they are cumbersome and great ungainly beasts, in the water like many aquatic animals, they become lithe and graceful with the blubber that made them ungainly on land becoming essential as insulation and serving to give them a smooth torpedo shaped outline making them very streamlined. Elephant seal pups are born in the Antarctic spring. Like many Antarctic seal pups, they stay with their mother increasing rapidly in weight while the mother gets progressively thinner, this happen for about three weeks and then the mother leaves to go to sea and leaves the pup behind. That's about as far as parental care goes with Southern Elephant Seals. The pups are very dark at birth and have quite delicate flippers with long elegant nails that they scratch themselves with quite precisely. 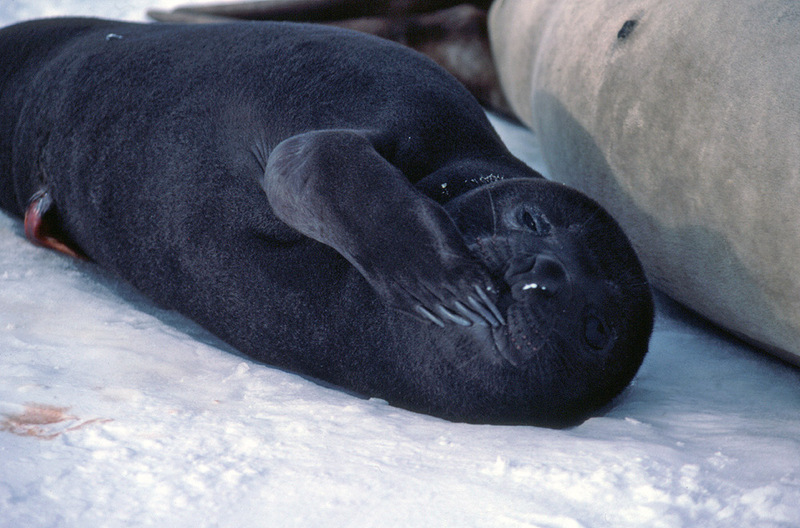 If Weddell seal pups are big mobile unstuffed pajama cases with the personality of a reckless 5 year old and fur seal pups are small terrier puppies, bouncy and bold, then elephant seal pups are like little old men. Very precise and somewhat gnome-like, a stage that they grow out quite rapidly as they become teenagers (in elephant seal years that is). 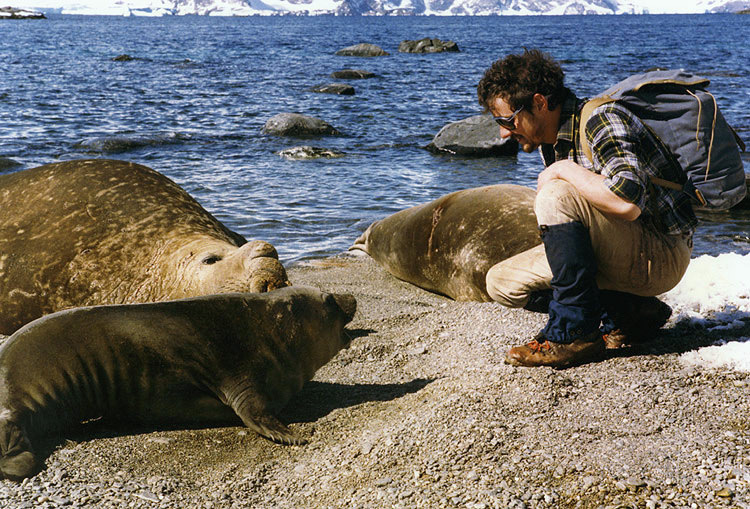 Antarctic seals are generally completely unafraid of man despite the inglorious days of sealing when hundreds of thousands of them were killed fir their fur and/or blubber. 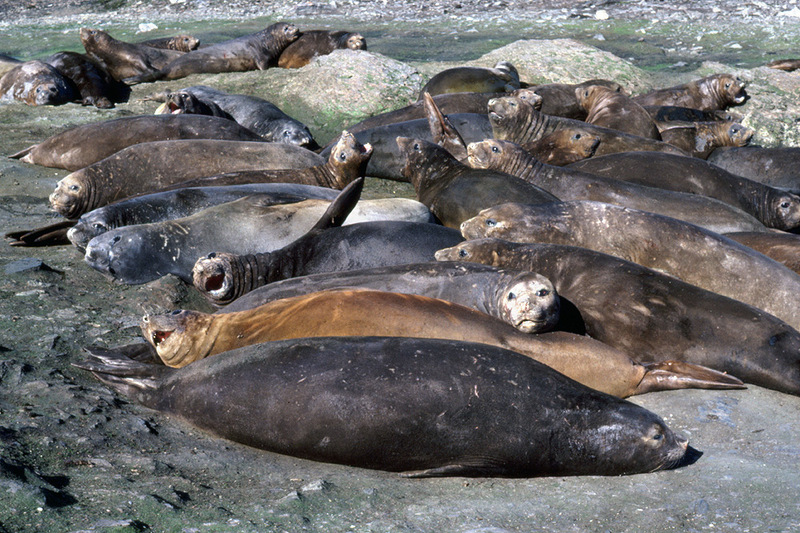 Being big, possessed of much blubber and congregating conveniently in large numbers on beaches, elephant seals were one of the preferred target species on an industrial scale being killed right up until 1964 at South Georgia. These days the recommendation is to stay considerably further away than the man in the picture to the right is, the small weaned pup in the foreground has just had his very close-fitting personal space invaded and isn't that happy - although he doesn't seem to be that bothered either to be honest. The larger and older seals nearby seem completely unflustered. The only time these seals get very upset is if you approach them walking upright. When they threaten each other, they rear upwards to get as much height as they can and so assume that an upright figure is being aggressive and so is a threat. If you get down low as this guy has done, they are pretty much unfazed, though by that time you may be uncomfortably close to a ton or two of smelly, sharp-toothed, animated blubber while being a bit slow off the mark as you're now squatting down. Copyright picture used by permission: Two male seals fighting - Laëtitia Kernaléguen (Deakin University), used under Creative Commons 2.0 Attribution license. Bibliography: McCann, T. S., M. A. Fedak, and J. Harwood. 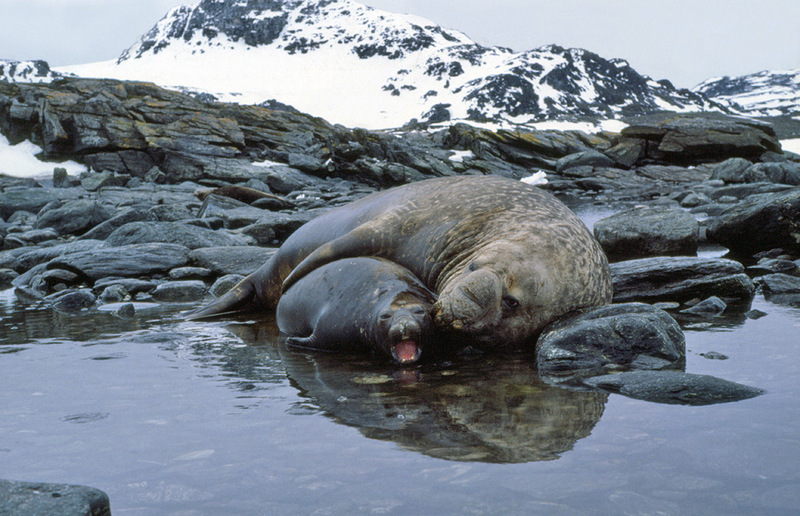 "Parental investment in southern elephant seals, Mirounga leonina." Behavioral Ecology and Sociobiology 25.2 (1989): 81-87.